From time to time, we hear an interesting story that is told so that we may learn something more. 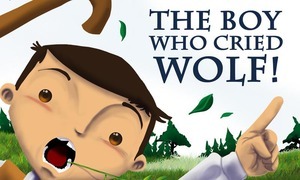 Do you remember the fable about the boy who cried wolf? Perhaps it is more than a simple story about the harm in speaking lies. Some time ago, a young shepherd just into his teens was given the care of a small flock by his father, so that he may learn the responsibility that comes with becoming a man. Along with Rusty, the best sheep dog and friend ever born, he felt prepared for anything the farm could throw at them. Except maybe for the endless bleating of sheep and the boredom that comes with them. Boredom often gives birth to trickery and pranks. “Wolf, there is a wolf in the paddock!”, the young man cries as he hides behind a particularly lazy and fat ewe, snickering. Seconds later his father and older brothers sprint into the field breathing hard, bows at the ready. Caught up in the excitement, Rusty runs around them playing and barking at their antics. Needless to say, the conversation at the supper table that night was one for the record books. This only calmed things down for a short while however, until boredom set in again a few days later. “I have got to think of something better,” he murmured to himself one hot afternoon, “they won’t fall for it a third time.” Rusty’s ears suddenly shot forward as a growl was ripped from his throat. Streaking off like a shot, he angled toward the woods and the large grey wolf standing at the forest edge. Terrified, panicking, the young man screamed and ran for his father. With Rusty barking in the background, his brothers shake their heads and refuse to be fooled yet again. This time however, the young mans cries for help are punctuated by a fierce growl and horrific yelp. “Rusty!”, the boy screams and runs back toward the terrified sheep. Most people will tell you that this is a tragic lesson about the harm that lies can cause. You know what? They are right, but there is more as well. You see, to the Children of God, this old story is not only about lying and integrity; it is also about the need for repentance! How would this story have changed if this young man had changed his mind and actions because he felt true sorrow the first time he lied? How would our lives be different if we learned the same lesson? Think about it.